The Geological Survey of Canada collaborated with Nunavut communities and the territorial government to establish ten permafrost monitoring sites between 2008 and 2009. A summary of ground temperature data collected over a five year period is presented as a digital database. 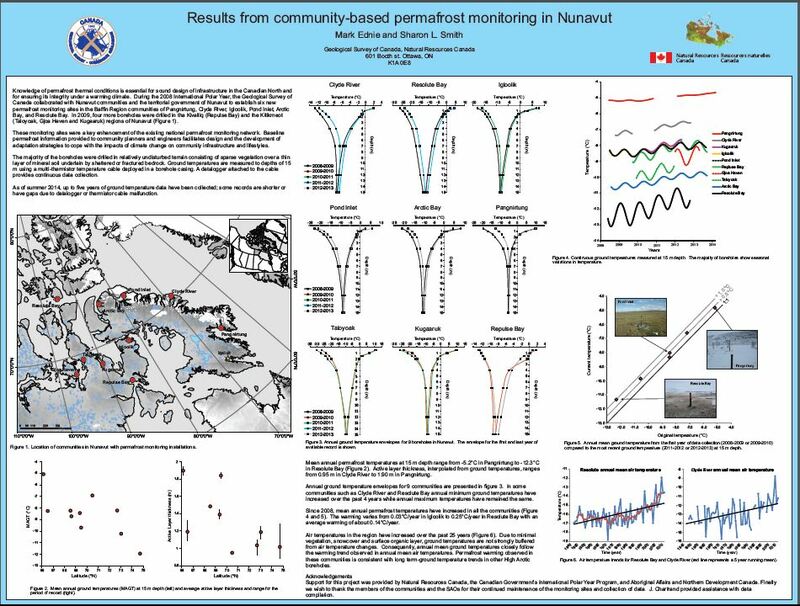 This information improves the characterization of permafrost thermal state and support climate change adaptation planning in Nunavut communities. Records of permafrost temperature indicate that mean annual temperatures at 15 m depth range from -5.06 °C in Pangnirtung to -11.93 °C in Resolute Bay. In the approximately 5 years since site establishment, ground temperatures at 15 m depth have increased between 0.04 ºC/year and 0.25 ºC/year with an average increase of 0.17 ºC/year for all sites. The Geological Survey of Canada collaborated with Nunavut communities and the government of Nunavut to establish 10 permafrost monitoring sites. The monitoring sites provide information to improve the characterization of permafrost thermal state and terrain sensitivity in the communities. Five years of permafrost temperature data indicate that mean annual permafrost temperatures range from -5.06°C in Pangnirtung to -11.93°C in Resolute Bay. Since the start of the monitoring, ground temperatures have warmed between 0.04ºC/year to 0.29ºC/year with an average of 0.15ºC/year for all sites.